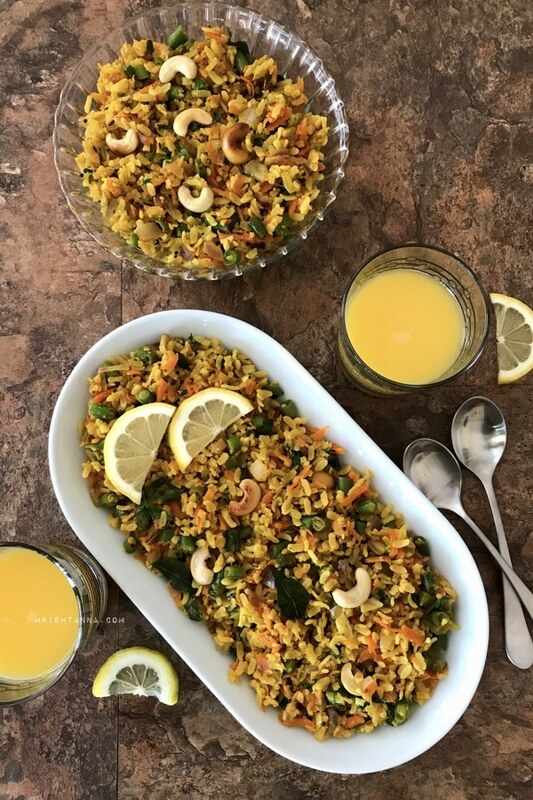 Vegetable Poha is a quick breakfast or snack food made of beaten rice or flattened rice from the Indian cuisines. 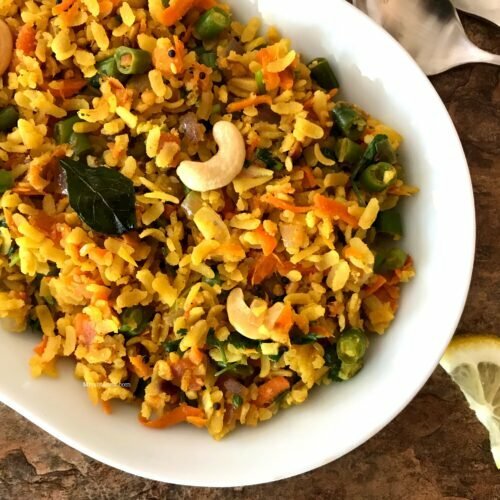 Growing up in South India, Poha was a staple diet in my household. I never really appreciated the goodness of Poha until I realized how easy it is to cook and how nutritious they are. Based on a quick survey of readers I could see that not many people actually know what Poha or Flattened Rice is. So, I take this opportunity to show you how you can prepare this yummy and easy meal that can be a perfect lunch option for kids or for a weekend breakfast. Flattened rice comes in as many varieties as there are types of rice. It comes in varying thickness too. Generally speaking the thinner it gets, they are lighter on the stomach and hence easily digestible. Poha from brown rice is known for the low glycemic index and generally used for breakfast. Cooking these flattened rice is a lot easier and lot faster than cooking rice, but the procedure is entirely different. Dry spices mixed in with a base of green spring vegetables forms a good medium to mix in slightly soaked Poha to make this recipe. The choice of vegetable is really up to you. I chose to have carrots, tomatoes and green beans in my recipe for a bright and colorful mixture. You can try Parsnips or Â Chinese long beans too. As long as you allow enough time for the vegetables to soften, the Poha takes care of the rest. 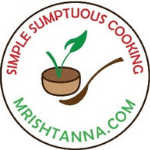 You can find Poha or flattened rice in any Indian grocery store and also on Amazon. You donâ€™t have to plan ahead. As long as you have some vegetables and Indian spices, you are all set. Vegetable Poha is a quick breakfast or snack food made of beaten rice or flattened rice from the Indian cuisines. Soak the Poha in water for 5 to 8 minutes. Strain the water and place it aside. Place a pan over medium heat and saute the cashews over vegetable oil. Add mustard seeds, cumin seeds, urad dal and sautÃ© until they sizzle or pop. Add ginger, chilies, and curry leaves and sautÃ© for 30 -40 seconds. Add onions and sautÃ© until they turn translucent. Add grated carrots, beans, and tomatoes. Add salt to taste. Cook for 2 minutes and then add spices like turmeric, chili powder, and Garam Masala. Cook for about 5 minutes until the raw smell is gone. Now, add the strained Poha and cook for 5 minutes over low heat. Switch off the heat and drizzle few teaspoons of lemon juice and garnish with Cilantro before serving. 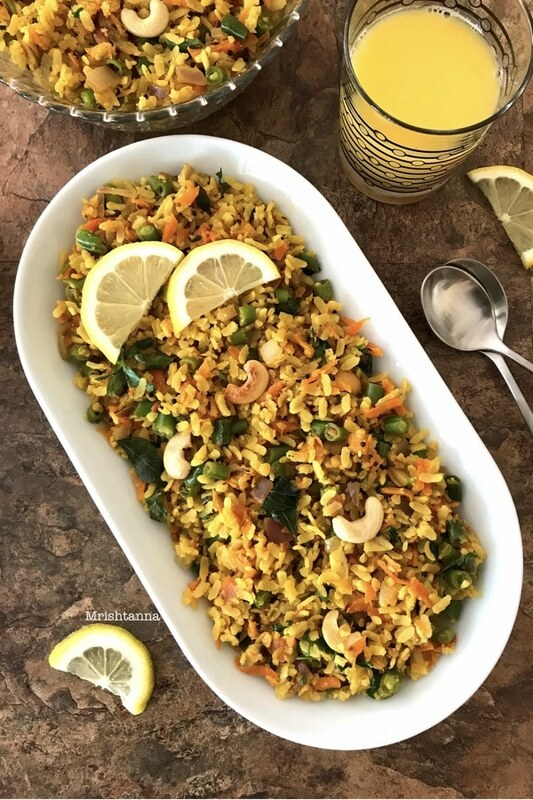 Vegetable poha or spiced flattened rice is ready to serve. Vegetable poha looks absolutely inviting and colourful. Wholesome and delicious Uma. Lovely dish. Poha looks very tempting! Our family favourite breakfast… Loved it!! Poha looks so inviting. Perfect breakfast recipe. Loved your click. Great share. Lovely idea of adding veggies to the poha.. Healthy option. Colourful, healthy Indian food. Perfect for any time with hot cup of tea or coffee. Loved the colour. That’s seriously quick, sounds amazing and looks picture perfect! Thank you for the very useful information on poha. It’s not a part of staple diet in Lahore but I’m tempted to go search for it. Maybe I’ll buy it online. As I sit to comment on your post, guess what is in my breakfast bowl? Poha. I use brown rice poha and red rice poha too along with the regular organic variety. It is a wholesome breakfast or in my case sometimes and early dinner option too on days when I am too tired to cook or just lazy. Loved the addition of vegetables making it healthy and colourful. Thank you Vidya 🙂 I totally agree this is light and healthy! Even I use peanuts sometimes:) you can use any kind of nuts! Poha is a preferred breakfast, it is tasty and easier to prepare. Addition of these veggies has made it more tasty and healthy. 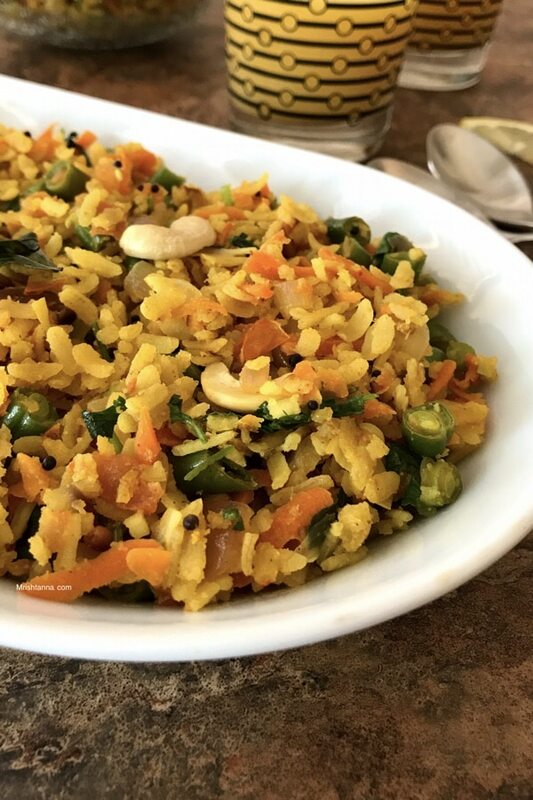 Poha is something I can have for breakfast almost every day.Love the addition of vegetables, makes it healthy and more delicious.